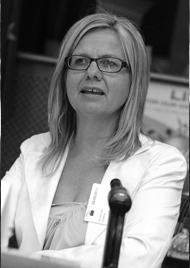 Dr. Julia Georgi is an Associate Professor, Head of the Department of Architecture, Land and Environmental Sciences, Neapolis University of Pafos (Cyprus) and Member of Senate Committee of Neapolis University (2013-2018). Dr. Julia GEORGI received her PhD in Urban Environmental Design at the School of Geotechnical Science, Aristotle University of Thessaloniki (Greece), her master’s in landscape architecture from University of Newcastle Upon Tyne (UK) and her bachelor’s in forestry engineering and Natural Environment and from Aristotle University of Thessaloniki, Greece. She has served for 15 years as executive professional in Forestry Engineer and Landscape Architect at the Ministry of Environment, Urban Planning and Energy – Climate Change of Greece. During her service at the Ministry she served as General Project Manager at the Environmental Awareness Park Organization of Antonis Tritsis, the largest urban park in Greece (120 Ha). During the years 2000-2004 she offered her expertise as General Project Manager and Head of Green Department for the Athens 2004 Olympic Games and she designed and supervised the construction of significant landscape projects (urban, periurban parks, greenways, venues). From 1997 to 2000 she was Head of the Environmental Department of EGNATIA ODOS S.A. Design/Construction Company which specifically designed and constructed Egnatia Odos, the transnational Road from Adriatic Sea throughout Greece up to the boarders with Turkey.Lastly, she exhibits an extensive professional expertise in landscape architecture since 1994.
d) Aristotle University, Thessaloniki (in the period 2001-2015) (Greece) within the Master of Landscape Architecture.